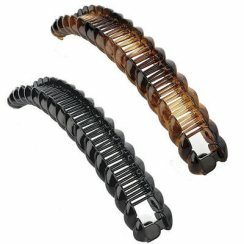 Style your hair with a chic and versatile banana clip the next time you need to create a casual or elegant hairstyle. The banana clip is named for the shape the clip imitates -- the banana. Our banana clips come in various shapes and sizes to accommodate different hair lengths and thicknesses. Inserting the clip into your hair is a simple procedure and will create instant flair and panache. Free delivery is standard for all UK purchases. £1 Maximum Postage charge to Europe & £1.50 to the Rest of the World.